As published in Products Finishing Magazine, April 2019 issue. Q: What is the best way to increase the bath life and quality of trivalent passivates on zinc plate? A: One of the more significant developments of the last 20 years in the metal finishing industry is the commercial development and application of trivalent passivates on zinc electroplate. These developments have allowed applicators to eliminate the use of toxic hexavalent-chromate conversion coatings, thereby safeguarding the health of all involved in the handling and processing of zinc-plated parts. Further, these trivalent passivates have a substantially positive impact on the environment. The following information addresses issues involved with producing a consistent blue-bright, thin-film passivate on electrodeposited zinc. 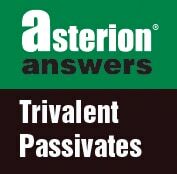 Trivalent passivates are typically acidic in nature and operate at a pH between 1.6 and 2.2, under most operating situations. Therefore, during the passivation step, both zinc and iron will be dissolved in the passivate solution, and their concentration in the passivating solution will increase. The zinc comes from the surface of the plated part and the iron comes from unplated areas (such as blind holes, tubular parts or parts lost from racks and improperly fitted barrel doors). These lost parts will, with time, have their zinc coating dissolved by the acidic passivate, followed by iron dissolution from the part itself. Increasing both iron and zinc can cause the problem of “yellowing” the parts. The mechanism of yellowing differs for zinc and iron. A chrome 3-zinc complex is formed in a good passivate film. This results in a blue-bright finish. As the iron increases in the passivate solution, a yellow-brown, zinc-iron-chrome 3-complex forms. These are competitive reactions, and the intensity of the yellow color will depend upon the iron concentration. The typical iron limitation is 300 to 1000 mg/l. Since this is a competitive reaction, the iron concentration can be moderated by increasing the chrome concentration in the passivate solution, thereby preventing the conversion film from turning yellow. We also need to consider the increasing zinc content. Read more.